Pack your bags, homify readers, because we’re travelling to Queretaro, Mexico to check out a beautiful contemporary dwelling. Known as the ‘Place of Stones’ this inimitable location boasts incredible geography, topography, and plenty of challenging aspects for architectural plans and structures. 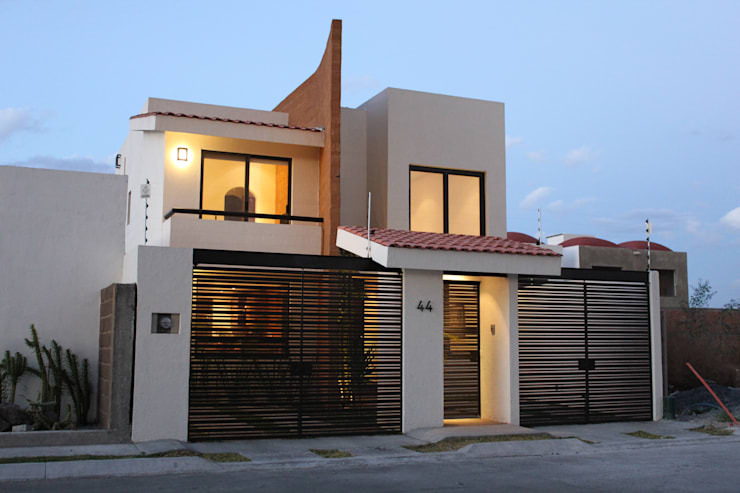 Despite these hurdles, experts Arquitectura Mas have designed an incredible residence that offers just as much for those living within, as those who view it curbside. Replete with an array of avant-garde angular shapes and forms, this eye-catching property is alluring and unique. Private, attention-grabbing and elegant, we’re privileged to today take a tour of this domicile, picking up some wonderful décor tips and tricks along the way. The exterior of this house is where the fun truly begins. Combining four different materials—concrete, tile, terracotta and iron, the fascia is elegant, eye-catching and individual. Set on a small plot of only 180 square metres, the architects needed to get creative to make the most of their limited space. The actual living space is a rather generous 165 square metres, which is set over two storeys, and is just perfect for a small family. Eye-catching and unique, these building materials definitely exude a certain flavour within the neighbourhood, contributing value to both neighbouring architecture and the occupants who are privileged to call this house home. The interior embraces neutral hues and a sense of elegance. 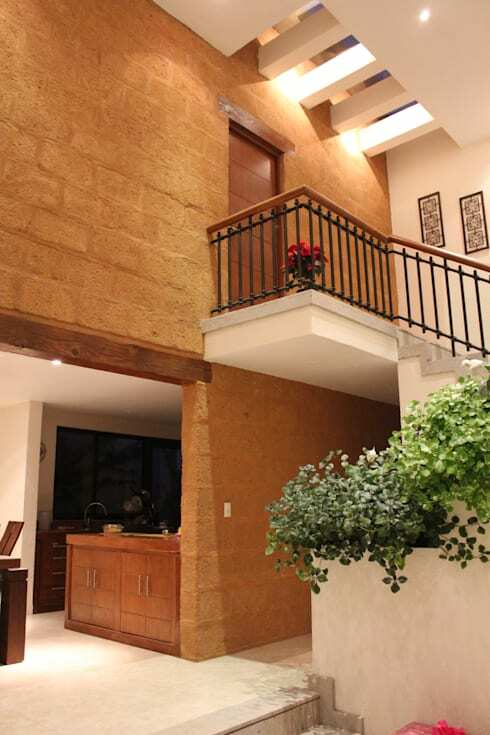 Earthy stonework is uniform in colour, while still implementing a few natural differences that are essential in keeping the space interesting and unique. Square dining tables are one of the lesser-used shapes but offer a wonderfully equal ambience within their space. Instead of someone sitting at the head of the table, a square setup promotes conversation between all members of the party. Decked out in modern aesthetics, the room is visible through a large entranceway that leads into a more private and cosy eating space. We're definitely getting a better idea of the feel and aura within this home, which is appealing and rather spacious. Focusing in on the staircase we see one of the ingenious ways that this home is illuminated. 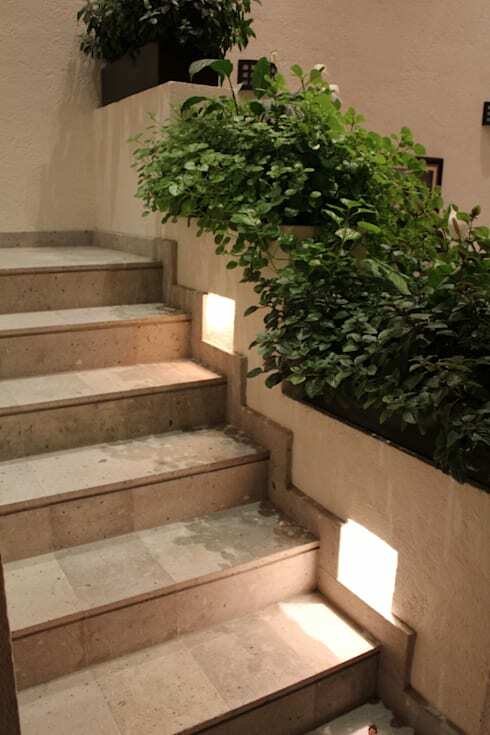 With recessed lighting embedded into the stonework, the stairs are delicately luminous. 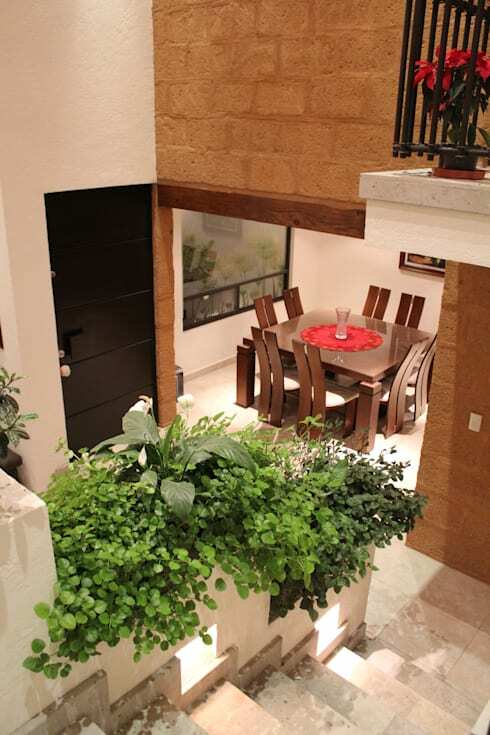 Once again we see the lush greenery that helps soften the natural stone walls and floors. These not only purify the air but assist in creating a highly desirable atmosphere of relaxation, peacefulness and calm. Working with negative space is often one of the trickier aspects of design, especially when you're dealing with a limited or compact floor plan. However, if you manage to actually leave certain spaces empty, you'll end up with a far more spacious and airy home. This is exactly what has been achieved here, with a truly inviting and cheerful ambience. If we look at the top right-hand corner of the image we see the ceiling that gives way to a roof light. Set above the hallway, this is lovingly placed to offer a romantic balcony view of the ground floor below. Downstairs we see the timber-clad kitchen, as well as a narrow corridor that offers access to other rooms on this level. Heading back to outside to the front of the house, we're able to grab a quick peek at some of the landscaping. 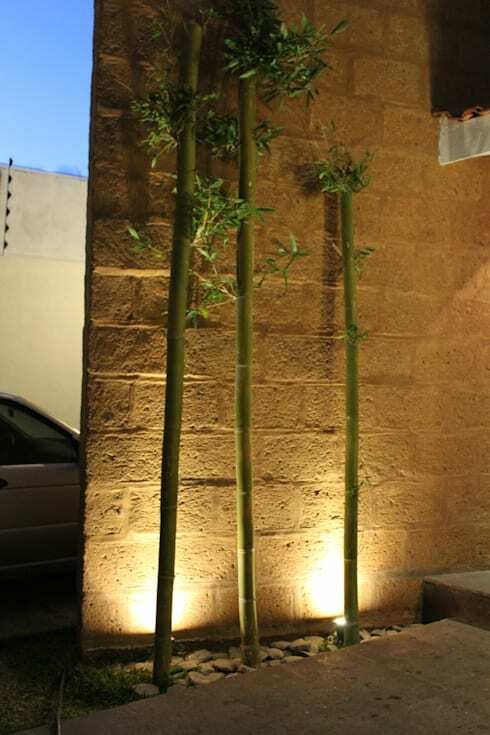 Here three basic bamboo stalks enhance the exposed stone. Illuminated by ground level spotlights, the trees are presented in all their simplistic beauty. Refreshingly Zen, this space is ideally decorated as an entry, providing occupants and guests a welcoming, warm and cheery invitation. What did you think of the combination of different materials used throughout this dwelling?